The Avocent� UMG2000-400 Universal Management Gateway appliance is a multi-purpose appliance that consolidates access and control to all facilities and IT assets. 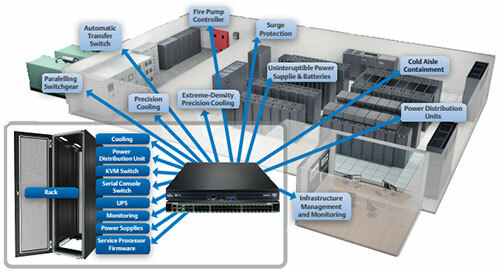 The Avocent Universal Management Gateway appliance uses proven technology to deliver a single, unified approach for data center infrastructure management (DCIM), including remote data center management. Auto-Sensing and Device Discovery - The UMG2000-400 has the ability to automatically sense and connect to new devices directly connected to a physical port on the appliance, thus eliminating the time-consuming task of manually reconfiguring infrastructure changes. Containing 40 ports (8 auto-sensing), the appliance automatically detects if the port is connected for serial or embedded service processor access. Device discovery occurs over the network and the appliance can automatically discover, identify and connect up to 256 embedded service processor targets.